Additional Info: Born in 1998 in Nottinghamshire, Chris first got into music at the age of three when he asked for a drum kit for Christmas, and much to his surprise received one. It would take another five years, however, for his love of music to really develop when he began to learn the flute. From here he began to learn many other instruments, became involved in arraging and composing, and has participated in multiple concerts and musical events in addition to organising his own. 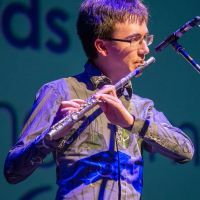 As a flautist, Chris progressed rapidly from his humble beginnings at the age of ten; achieving his DipABRSM four years after first picking up the flute, and a fellowship two years later having got distinctions in his LTCL diplomas in cassical and jazz flute. Similar achievements can also be seen in the other instruments he plays, holding an ATCL for saxophone and has up to grade 8 in drum kit, voice, piano and organ. His playing has taken Chris to all corners of the UK and abroad. He spent three years in the Royal College of Music Junior Department learning flute with Katherine Bicknell and Nicolas Bricht, voice with Kate Lewis and Joy Hill, and organ with Daniel Moult. Chris has also attended the Oxford Flute Course in Oxfordshire and Grolloo flute residential in Holland, enjoying the sensational tutoring of flautists including William Bennet, Wissam Boustany, Ian Clarke, Robert Winn, Mattias Ziegler, Leon Berendse, Kate Hill, Robert Manasse, Philip Rowson and Peter Verhoyen, and had lessons with Katherine Bicknell, Noemi Gyori, and Paul Edmund-Davies. He currently studies with Simon Channing, professor of flute at the RCM. Chris has played with numerous ensembles in his career thus far, from county big bands and jazz bands, to huge orchestras such as the Junior Hallé, Junior CBSO, RCMJD Symphony Orchestra, National Schools Symphony Orchestra. English Schools Orchestra, and National Youth Wind Orchestra. He has also played with smaller but equally prestigious ensembles such as the Pro Corda Chamber Orchestra and Midlands-based Classical Supergroup. As a singer Chris began singing in choirs aged nine. He currently sings evensong with Derby Cathedral Choir. He has also sung with the Hallé Youth Choir, Voices Choir, and RCMJD Chamber Choir, with whom he sang in the Royal Albert Hall for the youth prom and premiered composer Gabriel Jackson's Passion at St James' and St John's churches in London. Chris has reached the category audition round of the BBC Young Musician competition multiple times and was a finalist for the Royal Philharmonic Society Young Musician and Gregynyog Young Musician competitions. He has won multiple other competitions including the Thelma King Young Instrumentalist award, Dalesmen Young Musician award and multiple regional young musician competitions for his playing and singing in all genres. He was recently awarded The Cap, a prestigious award for representing on a national level which is only usually given to sports captains in national teams, becoming the first ever musician to be given the award. Fascinated with the construction and evolution of the flute, Chris has amassed a collection of instruments featuring antique flutes from the end of the romantic era, wooden and metal modern-system flutes and folk instruments ranging from Native American flutes to Irish pennywhistles. Chris regularly collaborates with other artists from all genres to create unique crossover music. Recently he has collaborated with Jimmy Power to create the single "Transience" featuring Jazz-Inspired improvisatory flute playing with an electronic accompaniment. Next he worked with violinist-stroke-beatboxer Faz Shah to create adaptations of the pieces "Summer Ice" and "Shisha Pro".